I trotted through the Urban Wine Trail in Santa Barbara after a friend suggested the route when I told her my boyfriend and I were celebrating our anniversary on the American Riviera. While on the trail–which has the feel of a bar hop swapping cocktails for wine–the lovely people at Oreana Winery suggested we check out Area 5.1 across the street. It’s a small tasting room, tucked into what seems like a business plaza, much different than other wineries on the trail that actually make wine on the premises. Rather than looking like a traditional tasting room, the winery felt like a classy sports bar. Football was playing on TV–which I usually dislike in wine tasting rooms, but it went with the vibe– and a large scoreboard-like marquee noted who made what wine and who was on duty. Area 5.1 is owned by two Australian guys who decided to play off their resident alien statuses. All their wines are blends and cheeky takes on secret government investigations of the other worldly. I bought two bottles of wine from them, a white blend called White Light and a red blend called Majestic 12, although they were over my typical price limit. I was on vacation! It was my anniversary! I was getting tipsy! This review is about the White Light. I’ll tell you about the Majestic 12 another time. 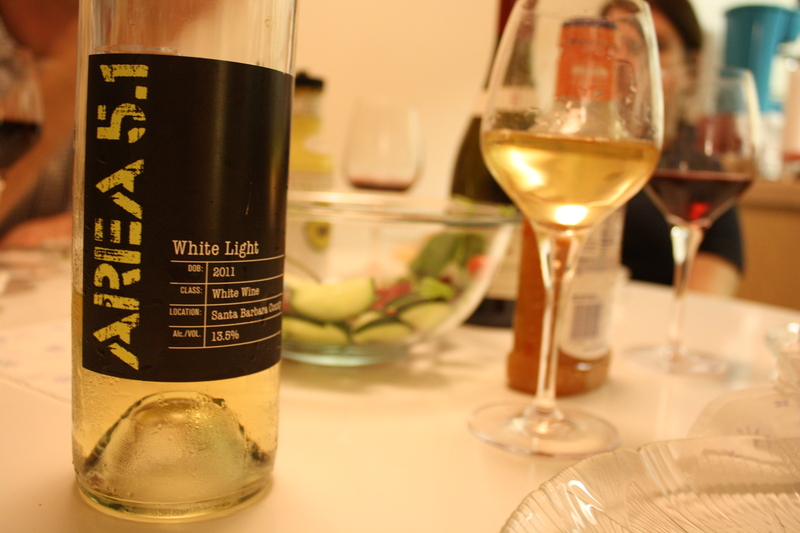 White Light was crisp and refreshing, fruity–think tropical tastes– without being sticky on the tongue. I uncorked it at a dinner party we had with some friends. We made shrimp strifry, cookies made from the spent grain left over after we home brewed pumpkin beer, and toasted with glasses of White Light. I would definitely drink it again! When to drink: At a bachelorette party dinner, before the shots. We’re glad you enjoyed the White Light and your Funk Zone tasting experience! Let us know what you think of the Majestic 12. Pair it with a big red sauce Italian pasta dish!